Xlendi Bay Gozo is located at the bottom of a very steep valley starting from the village of Kercem which is located very close to Victoria (Rabat), the capital city. During the descent down to the Bay one can appreciate the greenery all around and the deeper one descends into the valley, one may also notice the abundance of cane growing in the valley, depending on the time of the year arriving at the car park soon after. Xlendi Bay Gozo is a seaside resort located on the south west of the Island. This popular locality is regularly visited by tourists and Maltese alike, and not least by the inhabitants themselves. The beach is small but it is one of the best spot on the island. Due to its geological formation and the shallow sloping pebbly beach, the Bay used to be a sleepy fishing village where to date some fishermen still retain a few of the remaining boat houses. It was also popular as a summer residence where a number of locals kept a small house. They would use it during the hot summer months as people have always been attracted to the tranquility that this location offers. Nowadays Xlendi Bay Gozo has been transformed into a resort area where most of the properties have been transformed into restaurants, bars, shops, guest houses and hotels. It is an area very sought after due to its beauty. The promenade, although small, is very pretty especially in summer, when it is lined with tables close to the seashore where one can enjoy a relaxing meal close to the water’s edge. Although the area has grown in size due to commercial and residential developments, which offer many different types of accommodation, however the area still retains its natural tranquility. Apartments are numerous but here you have the location as a bonus. The hotels located here are mentioned in Xlendi bay part two. Upon arrival you will notice that the old traditional coloured fishing boats are still anchored in the bay alongside the modern pleasure boats, representing what this location is today – a mix of old and new setting happily next to each other. The bay is also great for swimming. All along the left side of the bay there is a walk way with stone benches set upon rocks where people can leave their belongings and jump into the sea for a refreshing swim. In this area a buoy line enclosing a long stretch of coast serves to indicate a swimmers zone whilst also serving as a protection to swimmers from the boats that move around in the bay. There are several ladders to aid swimmers to climb out of the water. Xlendi Bay is also popular with visitors in the evening who come to enjoy a leisurely stroll along the promenade in the balmy summer evenings, with many stopping to have a quiet meal at one of the local restaurants sitting at the water’s edge. It is also popular with families who come along with their children for an ice-cream at a popular parlour which makes home-made ice-cream. This bay is wonderful all year round as spring and autumn are also lovely seasons during which to enjoy this lovely unique location. This location also offers great walks along the coast in various directions on rough terrain including an interesting walk towards the watch tower located at the mouth of the inlet. - It is cleaned by the local authorities. - There is not much space where to bring you own chairs and umbrellas. - If you succeed you can grab a bench along the right rocky side. - Due to the small pebbly beach sunbeds are not rented. - Further up the beach as show in the photo sunbeds and umbrellas are available on the right side of the outer bay facing the beautiful cliffs and blue deep sea water. - Getting here is very easy. - The capital city Rabat, also known as Victoria, is centrally located and well connected with the surrounding villages. - From Rabat follow the signs to Fontana and from there you can start the descent down to the valley until you reach this location. - HSBC ATM available beside the parking area. - The Gozo buses offer the following service. - The bus routes operate every hour in each direction all days of the week all through winter and summer. - Sightseeing buses operate around the island from 09:40 till 17:40 visiting all the major attractions of the island, of which this bay is one of them. - If you are travelling by rented car, one will find a car park at the bottom of the hill and a few meters away from the centre of the resort. - There might be some inconvenience to succeed to swim but with some help you might do it. - There is a rest room on the right side of the beach close to the restaurants. - It is possible to rent pleasure boats for various activities you wish to do while you are in Gozo. - The sea will sometimes be rough and can be dangerous to swim in. - They are not allowed all around the beach area. - Moby Divers and St. Anthony’s Dives Cove are located close to the beach offering a service to those who wish to taste the beauty of the Maltese archipelago under water beauty. - Cannot erect any camp as the sandy/pebbly beach is small. Apartments in Gozo are numerous at this seaside location. 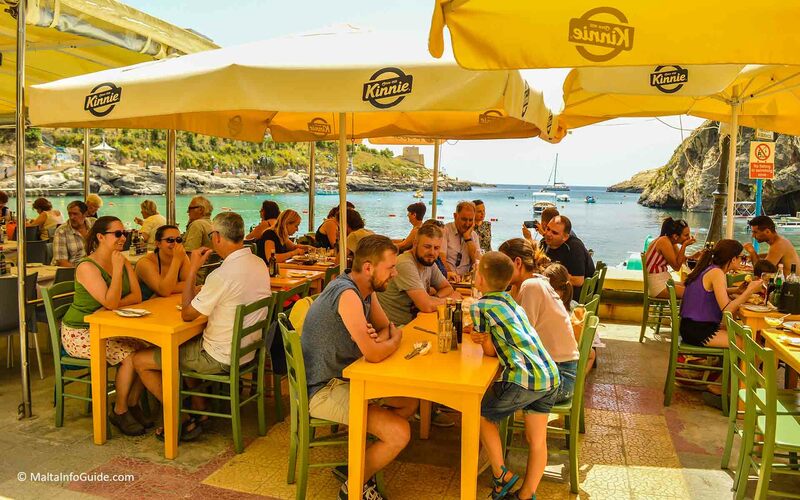 - Around 20 restaurants are located in this tiny fishing village. All compete with each other and the good service and food quality is not to be missed. - One would need to make a table reservation for certain restaurants during peak season either by phoning in advance or by having a stroll upon arrival checking out the different menus and then booking your table by the water’s edge. - The watch tower overlooks the entrance to this bay guarding its entrance. - It was built with a purpose since the bay is well secluded by surrounding the high cliffs. - The tower was constructed by the Knights of St. John, under the reign of Grand Master Lascaris during 1650. Along the road before you arrive to this location, one can find La Grotta disco – a popular location heavily frequented especially during the summer months. It is particularly popular with Maltese youths As it is considered t he place to be for the young generation on a summer Saturday night. Enjoy your holiday at Xlendi bay.